Water, sugar, glucose-fructose syrup, diced pickled red chilli (5%) (red chilli peppers, salt, vinegar), spirit vinegar, pickled garlic pulp (3%) [garlic, water, salt, acidity regulators (acetic acid, citric acid)], modified maize starch, garlic puree (1.5%), red chilli paste (1.5%) [red chilli peppers, water, salt, acidity regulator (acetic acid)], red pepper flakes, salt, colour (paprika extract). Mix well before use. 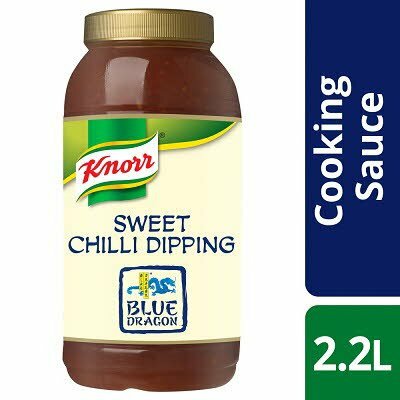 Use as a dipping sauce with traditional Oriental starters such as prawn crackers, spring rolls, fish cakes, vegetables in tempura batter or crudités.